Sweet potato is one of the few vegetables (side from potatoes) that my boys love. Needless to say, I’m always trying to come up with new ways to use the sweet spud. While chopping into chip shapes and roasting in coconut oil is my go-to move, these spiralized ‘noodles’ are a close second. They do take a little more active time to prepare, but I’ve found little fingers love getting the spiralizer out. And they only take 10 minutes in the oven so they’re pretty quick. I was surprised how much they both love tofu. It’s a great staple to have in the fridge for when you need some last minute protein. My favourite ways to use tofu are in an easy tofu scramble, as a tasty ragu, these tofu ‘steaks’ or pan fried and given a flavour boost with some honey and soy like in the recipe below. Make sure you buy firm tofu (rather than silken) and organic so there’s less likelihood of the soy being genetically modified. 1. Preheat your oven to 200C (400F). 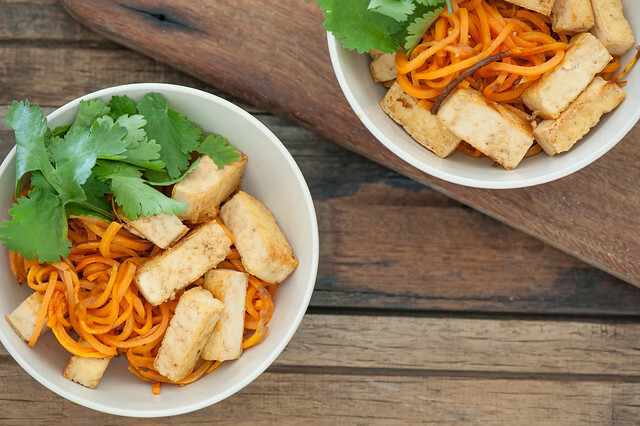 Scrub sweet potato and spiralize into medium ‘noodles’. 2. Place noodles on an oven proof baking tray. Drizzle with oil and toss to coat. Bake for 10 minutes or until ‘noodles’ are tender and cooked through. 3. Meanwhile slice tofu into 3 bricks about 1cm (1/3in) thick. Pan fry on a medium high heat with a little oil until golden brown on both sides. 4. Mix honey and soy sauce in a medium bowl. When the tofu is cooked, chop into bite sized chunks and toss in the honey and soy sauce. 5. To serve, divide warm sweet potato between 2-3 bowls. Top with tofu and sauce and coriander leaves (if using). extra crunch – serve with roast cashews or sesame seeds. green-free – skip the coriander or replace with cashews or sesame seeds. soy-free – replace with chicken thigh or breast fillets and adjust cooking time as needed. carb-lovers – toss in cooked noodles or spaghetti with the sweet potato. Or serve everything with steamed rice. low carb – replace sweet potato with 2 medium zucchini. And consider the chicken instead of the tofu. For more low carb ideas, see my other website Deliciously Diabetic. If you’re keeping things super low carb use a pinch of stevia instead of the honey. no spiralizer – chop the sweet potato into shoestring fingers and increase the cooking time until they are tender (about 20 minutes depending on your knife skills). If you’re thinking about investing in a spiralizer, you might enjoy this article: Do You Need A Spiralizer? other veg – carrots are also good. sweeter – feel free to increase the honey. gluten-free – use tamari or other gluten-free soy sauce. different sauces – oyster or hoisin sauce can be used instead of the honey and soy. more grown-up – toss in a little grated ginger and/or finely chopped garlic with the soy. And chopped green onions add lovely colour to the noodles. A few finely chopped red chillies wouldn’t go astray either. Or serve with Marco’s Chilli Oil. This over heavy oily noodles any day! My kids aren’t a fan of the zucchini zoodles, but I think I may be able to convince them with sweet potato! Will definitely give it a try. Mine aren’t too into the zucchini either Elisha (way too much green!) But they love these. I haven’t seen yellow zucchini Sandra – will try to get some seeds to grow them this Summer… more for me than the boys!